This Bouquet De Six tapestry shows the work of artist Jocelyne Anderson-Tapp. Based in British Columbia, Canada, the works of Anderson-Tapp shows floral elements in a stylized way. Here we see a modern design of red flowers in a vase with blocks of bold colors of crimsons, beige and olives. Contemporary in design and inspired by simplicity and elegance, this work contains many of the hallmarks of the works of Anderson-Tapp. 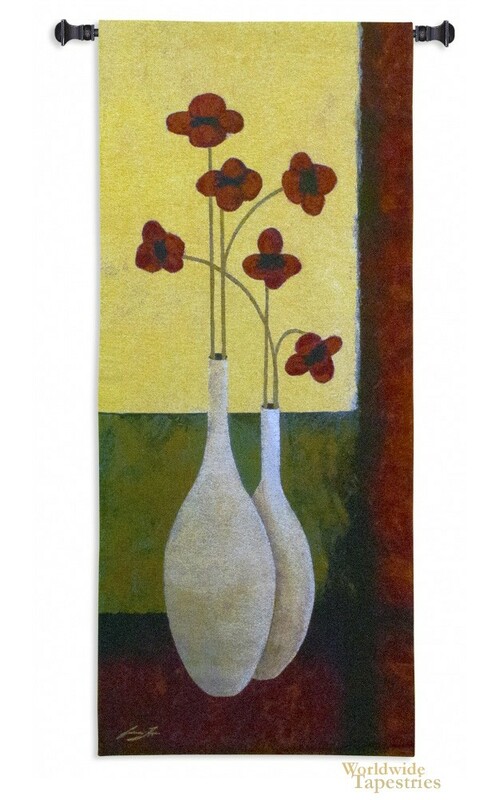 This Bouquet De Six tapestry is backed with lining and tunnel for easy hanging. Note: tapestry rod, where pictured, are not included in the price. Dimensions: W 27" x H 62"